Halibut fishing is predicted to be one of the best seasons ever! The Alaska Halibut is One Serious Fish! Every spring, our inland waters explode with an abundance of bait fish, which attracts schools of Alaskan Halibut, ranging in size from 10 pounds to 400 pounds. These Halibut rise from ocean depths of over 1000 feet to as little as 50 feet of water in search of bait as they begin their frenzied feast. Alaska Halibut are some of the finest athletes in the sea. With no body fat and pure muscle, these rod-straining fish can exhaust you by their brute strength as they fight you back to the bottom. We invite you to try your luck, with the assistance of our highly trained crew, in landing these robust monsters. Sport-caught Alaskan Halibut have weighed over 400 pounds. The typical fish caught on our fishing charters weigh between 20 and 80 pounds, with many fish over 100 pounds brought in daily. On September 16, 2004, we broke our Halibut record of 269 pounds with a whopping 348-pound lunker caught on a 24-ounce jig. An aspiring ichthyologist? 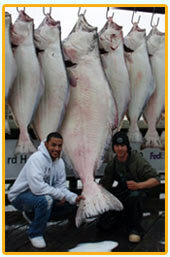 Learn more about Alaska Halibut at the Alaska Department of Fish and Game website. We recognize that you’ve invested a lot to make your Alaska fishing trip possible and we work very diligently to have your dream come true. From the most experienced angler to the fishing novice, we can provide as much or as little gentle guidance as you’d like. 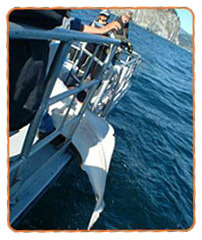 On your fishing charter out of Seward, you will travel 40 to 55 miles along the coastline to the fishing grounds. We have “near-coastal” fisheries, meaning that we are traveling up and down the coast to Seward’s most prolific Halibut fishing grounds. Now offering Long Range and Short Range Trips. We fish in depths of 50 to 425 feet, depending on where the Halibut are and sea conditions. We never travel more than 3 to 10 miles offshore, so if the weather gets bad, we actually have inshore areas in protected waterways where we can fish. To conserve the resource, we encourage you to keep only the amount of fish you can eat or share through the winter. Sound good? 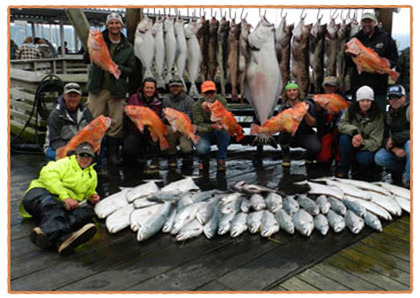 Make your Alaska fishing trip reservation now!